Remembering that Christmas is the feast of lights, and we are celebrating the coming of the Light of the World, try your hand at making candles with the family. The first step at making candles is deciding what kind of candle do you want to make: rolled, dipped, or poured candles, in taper, pillar, votive, or other shape? 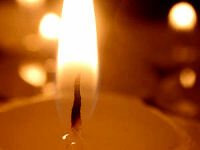 Think about the year ahead and what kind of candles you would like to use through the Church year. There are Advent candles, candles to have blessed on February 2nd, baptismal candles, Christ Candle, Mary Candle, Lumen Christi or Paschal Candle. Making a Paschal pillar candle now would be a great idea, so it can be blessed on Candlemas day, February 2nd. Then during Lent everyone can decorate it. Starting now can help the learning curve. A great thing about the craft medium of candles -- if you make a mistake, it can be melted down and started again. If you can, try to find some beeswax and make at least 51% beeswax. The candles smell wonderful, burn cleaner, less drips, and burn longer. Candle kits and candle making supplies are readily available at most craft stores and many stores online. For detailed directions on how to make candles, see Candles 101.